Why Do We Celebrate “Easter” and What Is the Deal with the Eggs? Keeping in mind that it will still be Easter-tide until the Feast of Pentecost, May 12th this year, it seems appropriate to have an Easter “Stump the Priest” Question. This one comes from unwittingly walking in on a men’s accountability group at a diner one Saturday morning. The men asked, “Where do we get the word ‘Easter’ and what is the deal with the eggs?” Both are very good questions. The Eastern Orthodox (Greeks, Russians, and various Eastern European Christians) do not celebrate Easter per se. They celebrate Pascha, which is where we get the word “paschal,” as in paschal candle or paschal mysteries. Pascha is a Greek word that is derived from Pesach, the Hebrew word for Passover. That makes sense and seems easy enough to follow, but if that is the case, where does the word “Easter” come in? A very modern drawing of what the goddess Eostre might have looked like, complete with bunnies. Essentially, what Bede is saying is that, the pre-Christian pagans called a month that corresponded to April “Easturmonath” or “Easter-Month” after their goddess Eostre. Once they became Christian and started celebrating the “Paschal Month” (give or take ten days or so), rather than calling the season something like Paschalmonath, they continued calling it Eosturmonath. As the season was still known as Easter-Monath, eventually the name of the Feast was replaced with the word “Easter,” it was “Easter-Month” after all. 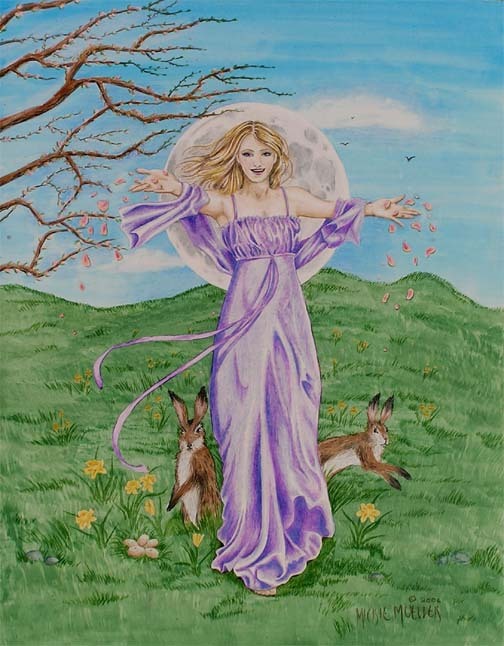 Here is the amazing thing about the goddess Eostre. We know virtually nothing about her. Anthropologists and folklorists believe that she was either a goddess of Spring and fertility or a goddess associated with the sunrise. Aside from that, she is a complete mystery. We know that Christians took over many pagan feasts and renamed them. December 25th was the pagan feast of Saturnalia or Yule. November 1st was the pagan feast of Samhain; it has now become All Saints’ Day. Christians take over these previously pagan festivals, perform a baptism of sorts on them and make Christian religious celebrations out of them. In most cases, we retain the knowledge of what the original festival entailed. That is not so with Easter. The Christian take-over of the pagan festival was so complete that only the name remains. What about the eggs? Surprisingly, they have nothing to do with the bunnies and do have a Christian origin. 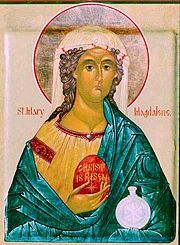 There are two legends that involve Easter eggs and both center around St. Mary Magdelene. In one story, St. Mary Magdalene was bringing a basket of eggs to the woman who had gone to the tomb of Jesus to finish His embalming. When the risen Jesus appeared to the saint, the basket of eggs miraculously turned the color of Our Lord’s blood. Similarly, another legend tells that, after the Ascension of Our Lord, St. Mary Magdalene left Jerusalem and went west. On one occasion she found herself dining with the Roman Emperor Tiberius (r. 14AD – 37AD). She greeted the Emperor with the words “Christ is Risen” (a tradition to this day among Eastern Orthodox Christians). The Emperor responded with a jaded, “Jesus could no more rise from the dead than that egg you are holding could turn red.” In response to the Emperor’s taunt, the egg, of course, miraculously turned red. 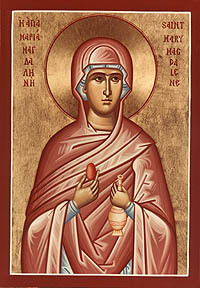 This is why, in many Eastern Christian traditions, the only acceptable color to dye is red and why in many icons St. Mary Magdalene is depicted holding a red egg. I’ve heard a story that the origins of easter eggs has more to do with the spring equinox. Chickens need at least 12 hours of sunlight to produce eggs, otherwise their bodies go into molting for the winter. The spring equinox is the first day that there is just as much day as there is night. So it’s about that time (conveniently near Easter) that chickens and birds of all sorts start laying eggs again. Many cultures and religions around the world celebrate this season together with the decoration of the newfound eggs. Obviously the pagan notions of these celebrations have crept their way back into the Christian celebrations. (I blame Hallmark and Cadburry.) The bunnies are certainly an example of that. Yes, they are definitely known for one thing, which is why they are associated with a fertility goddess and why rabbits’ feet are considered good “luck.” I would point to the image of Eostre used in the post as validating this idea were it not so obviously a 21st century re-construct. As for the eggs, varying traditions may develop independently and be completely unrelated. My brother and sister-in-law have chickens and we must get enough sunlight for them to lay eggs all year long. The joys of sub-tropical living! In Northern Europe this may have been why pre-Christian pagans associated with Spring-time. The Christian tradition more likely developed as a result of the associate of eggs with the Passover meal and the legends associated with St. Mary Magdalene.